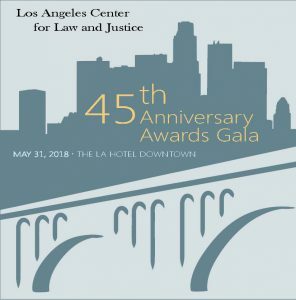 The Los Angeles Center for Law will be celebrating its 45th Anniversary Awards Gala this May! The annual awards gala is the organization’s largest annual fundraiser that brings together over 400 community members—including leaders from the nonprofit, legal and corporate sectors. Each year, we celebrate the efforts of those working to promote the safety and stability of domestic violence and sexual assault survivors in low income communities. This year, we will be honoring Lisa Vidal with the Justice Award, Delta Air Lines as Corporation of the Year, Irell & Manella LLP as Pro Bono Partner of the Year, and Jaime Camil as Cultural Ambassador. Please join us in congratulating all of the awardees for their exemplary service on behalf of survivors and the Latino community. Click here to purchase tickets or ad space.